THIS ARMY VETERAN SERVED HIS COUNTRY. WILL HIS UNDOCUMENTED WIFE BE DEPORTED? Ricardo Pineda was hesitant to wear his uniform. Two years had passed since he had served in the Army. Then again, so much was at stake, and the disabled veteran knew the uniform would leave no confusion about who he was: a man who had been willing to die for this country and now needed help to keep his family living in it. Pineda straightened the nameplate on his dress blues one day last month and entered a room in the Rayburn House Office Building, where he took a seat at a wooden table with members of the Congressional Hispanic Caucus. His wife, Veronica Castro, stood behind him in a red blouse, and next to her, with his hair buzzed military short like his father’s, sat their son Juan, a 17-year-old who suffered brain damage during heart surgery as a toddler. When Pineda’s turn came to speak, he told the lawmakers about his family’s precarious situation. 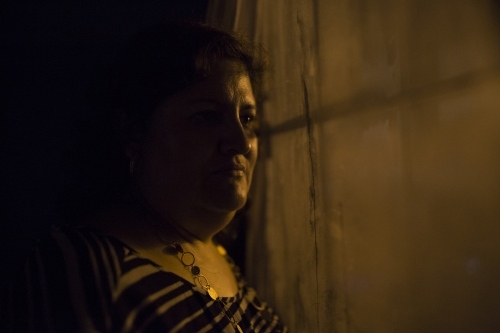 On April 4, Castro will walk into an Immigration and Customs Enforcement office in Baltimore, and she doesn’t know if she will be allowed to return home to her husband and their four children, who are all U.S. citizens. Castro, who twice entered the country illegally from Mexico, has faced these check-ins since 2011. But this one is different, she said. This is the 38-year-old’s first appointment with ICE since the inauguration of President Trump, whose aggressive stance on illegal immigration has widened the pool of those vulnerable to deportation, making the routine check-ins that thousands of immigrants face each year feel more fraught — even for a military veteran’s wife. After the meeting, some of the caucus’s members posted support for military families on social media. Several, including Reps. Raúl M. Grijalva and Ruben Gallego, both Arizona Democrats, have introduced legislation in the House that would help prevent the deportation of service members convicted of certain crimes and permit some to return to the United States. But none of the proposals would help their relatives. Pineda left the meeting with little hope, he said. Although he had been a soldier for six years and had dressed the part that day, he didn’t know whether this was a fight he could win. It is unclear how many veterans or their relatives have been deported or are in deportation proceedings. ICE officials said they don’t keep track. But one deported veteran, Hector Barajas-Varela, runs a small shelter called “The Bunker” in Tijuana, Mexico, for others who have lost the right to live in the United States because of drug convictions or other crimes. Although he has housed 20 deported veterans since 2013, Barajas said he has made contact with a total of 311 who have been returned to 36 countries. 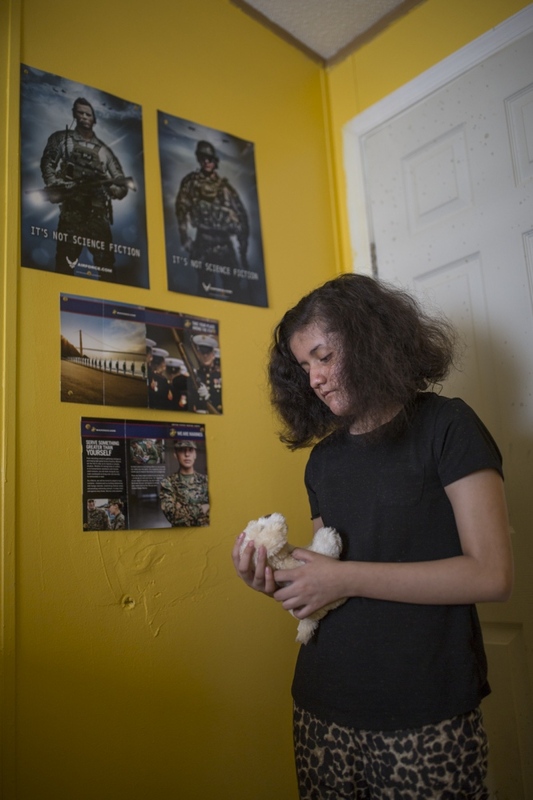 Emma Lozano, a Chicago church pastor, began helping service members and their families with deportation cases three years ago after she noticed men in U.S. military uniforms during a trip to Mexico. She attended the Congressional Hispanic Caucus meeting on Feb. 7 and plans to return to Washington on April 4 for Castro’s ICE check-in. Lozano has fought to keep Miguel Perez Jr., who served two tours of duty in Afghanistan and suffered a brain injury in an explosion there, from being deported. In 2010, Perez was convicted of selling more than two pounds of cocaine. This month, an immigration judge in Chicago ordered the father of two U.S.-born children to be removed to Mexico, the country he left when he was 8. Perez is appealing the deportation order. Sarah Rodriguez, a spokeswoman for ICE, said the agency “respects the service and sacrifice of those in military service, and is very deliberate in its review of cases involving veterans.” At the same time, she said, the law requires ICE to detain and deport anyone convicted of aggravated felonies. Castro’s attorney, Joshua Doherty, who works for the nonprofit group Ayuda, said the enforcement changes under Trump have made it much more ambiguous whether an immigration officer will take into consideration Castro’s role as a military wife and the mother of two children with disabilities. In addition to Juan, the couple’s 14-year-old son Kevin has cerebral palsy. Doherty said on the day of her appointment, Castro could be sent on her way and told to call if she moves; she could be given her next check-in date; she could be ordered to come back later with her bags packed for Mexico; or she could be detained on the spot. Pineda apologizes before guests walk through the front door of the family’s mobile home in Lothian, Md. When he received an honorable discharge for medical reasons in 2014, the family had to leave its five-bedroom house on the Fort Belvoir base in Northern Virginia. The trailer and lot is all they can afford on Pineda’s $2,250-a-month veteran’s benefits, he said. Their three sons share a bedroom, the fire detector goes off every time the dryer is on, and each room is filled with reminders of repairs Pineda can no longer easily make: a curtain standing in for a bathroom door, a broken shower, bowed floorboards outside the front door. Pineda was a carpenter before he was a soldier. Now, he can’t wield a hammer without pain. He cracked the bone at the base of his thumb during a combat training exercise in Richmond and a surgery left him with limited ability to move that finger. Pineda was 39 when he joined the army, older than most recruits but healthy enough to pass all the medical tests and compete with men half his age in boot camp. Now, he takes a half-dozen medications a day and has appointments at VA medical centers twice a week. Sometimes for his hand. Other times for diabetes and depression. He was stationed in South Korea for more than a year and said the stress wore on his health. He not only had to worry about the threat in front of him but also what could go wrong back home. 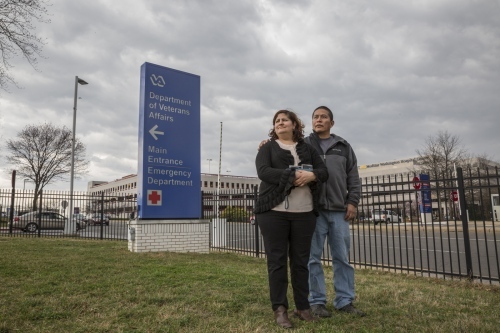 Juan landed in the hospital four times during his father’s deployment. 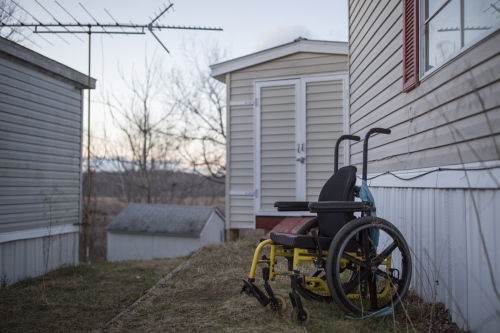 Castro, unable to get a Virginia driver’s license because of her immigration status, pushed their son’s wheelchair about 30 minutes each way from their home to the grocery store. “I kept thinking if my husband is carrying a backpack with a rifle, I can do this,” she said in Spanish. Ret. Sgt. Maj. Gabriel Berhane, who was Pineda’s commanding officer at Fort Belvoir, said he was disappointed to see Pineda leave the Army. Berhane, who works at the Pentagon, said he knows other soldiers who were not U.S. citizens. He was one of them. Born in Ethiopia, he had a green card when he enlisted and was a staff sergeant when he gained his citizenship. Immigrants with permanent residency are eligible to join the military, and about 18,700 on average were serving on active duty between 2010 and 2016, according to the Defense Department. Pineda gained his green card in 1986 and became a U.S. citizen two months after enlisting. While serving, he applied for his wife and their two oldest children, who were born in Mexico, to receive parole in place, which allows relatives of military members to apply for legal status while remaining in the country. He thought their approval would be automatic, but he was wrong. His sons’ requests were granted, and they eventually gained citizenship. Castro said she was given the border crossing card, which allows Mexican citizens limited travel in the United States, by a woman she paid to help her enter the country in 1998. Pineda was living in California at the time, and Castro had hoped to join him with their 1-year-old son, Ivan. After she was caught by Border Patrol agents and sent back to Guadalajara, Castro said she planned to stay there permanently and see her husband whenever he came to visit. Then two years later, Juan was born. Juan was 3 months old when Castro looked at him one night and noticed his eyes crossing and his mouth turning purple. She took him to doctors and eventually learned that he had a transposition of the great arteries in his heart and needed surgery. Pineda, then a member of the carpenters union, had insurance to pay for the surgery. So the family handed Juan to strangers who took him across the border using another child’s birth certificate, and Castro walked with Ivan, then 3, nearly 20 hours, drinking at one point from an animal trough when they ran out of water. At 3, Juan received his first surgery at a Northern Virginia hospital. Pineda doesn’t like to talk about those months his son spent in a hospital bed. He said the toddler could talk and walk before the surgery, but after an allergic reaction to the anesthesia he was left with brain damage, unable to speak or move much of his body. He was 8 when he began taking steps on his own again and now uses a walker at times to get around. On a recent afternoon, he pushed it down the hallway of his private school, the Linwood Center, which took him in 2015 after his public high school said it no longer could meet his needs. At the time, he would hurt others and himself, take off his clothes at inappropriate times and could communicate only by spelling out letters with his fingers, Linwood behavior analyst Erika Greszler said. Now, his challenging behavior has decreased and he’s “a talker,” she said. He uses an electronic tablet to communicate, calling it his “voice” by forming a V with his fingers and pointing to his throat. Greszler said she thinks that if his mother is deported it “would be devastating to his progress.” Castro is the parent who calls the school when he is sick or to check on his development. She’s also the one who helps him shower, brushes his teeth and meets him each afternoon at the bus stop. Juan sat next to her on a March afternoon outside a Washington church, pressing his shoulder into hers. They’d come to an immigration rights rally being staged by people from more than 60 different congregations. Christian, Jewish and Muslim leaders spoke about the need for solidarity, and when Castro’s turn at the microphone came she explained why she needed their support. 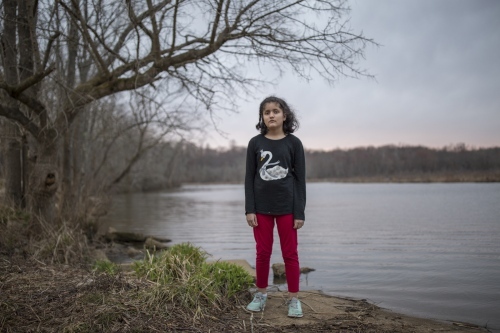 “My family would be destroyed if I’m not here to take care of them,” she said. Afterward, she and Pineda, along with two of their children, marched with the crowd toward the White House, comforted in part by a promise made to them. Members of those congregations plan to go to Baltimore on April 4 and wait alongside the family to learn Castro’s fate. UPDATE: Veronica Castro was not deported on April 4, 2017. Her next appointment to review her case is on April 2018. 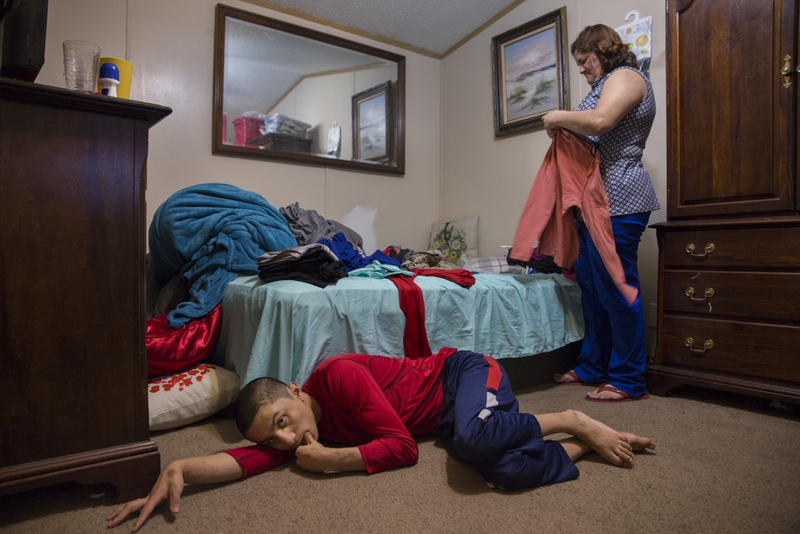 Juan Pablo Pineda lays on the floor while his mother Veronica Castro folds some clothes in her bedroom on February 8, 2017, in Lothian, MD. Juan Pablo has brain damage resulting from complications during a heart surgery when he was three years old and has been dependant on his mother ever since. The Pineda family eats dinner together in their mobile home’s kitchen area. The family moved to the area when Ricardo Pineda was discharged from the army in 2014. Veronica Castro caresses her son Juan Pablo in the bedroom that he shares with his 2 brothers. Juan Pablo has brain damage resulting from complications during a heart surgery when he was three years old and has been dependant on his mother ever since. Veronica Castro helps her son Juan Pablo walk back to the house during a power outage in their neighborhood. Juan Pablo has brain damage resulting from complications during a heart surgery when he was three years old and cannot walk long distances by himself because he loses balance. Veronica Castro helps her son Juan Pablo take a shower before going to bed. Juan Pablo has brain damage resulting from complications during a heart surgery when he was three years old and is unable to perform personal hygiene activities such as bathing or teeth brushing by himself. Veronica Castro helps her son Juan Pablo get in the school bus. Juan Pablo has brain damage resulting from complications during a heart surgery when he was three years old, has problems controlling his movements and has to use a harness during the bus ride. Juan Pablo Pineda, 17, at the Linwood Center school for children and adults living with autism and related disabilities in Ellicott City, MD. Juan Pablo has brain damage resulting from complications during a heart surgery when he was three years old and he has never been able to talk but he is able to communicate through sign language and other methods such as this electronic device. 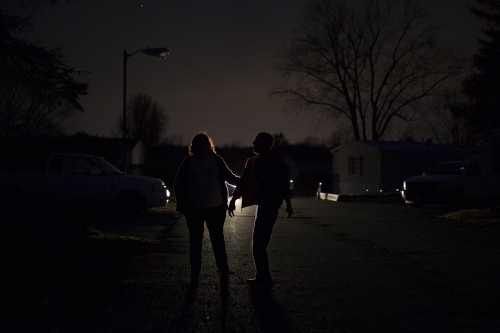 Veronica Castro outside her mobile home in Lothian, MD. Veronica Castro takes care of her husband and their four children, one with cerebral palsy and one with brain damage, and is also facing a possible deportation. 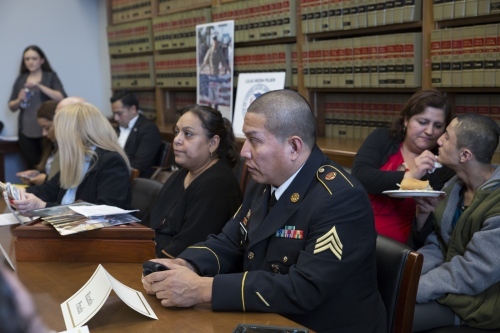 Army veteran Ricardo Pineda with his wife and son and other military families and supporters, attend a meeting with members of the Congressional Hispanic Caucus at the Rayburn House Office Building in Washington D.C. on February 7, 2017. The purpose of the meeting was to discuss a bill that would stop the deportation of veterans, military families and Gold Star families. 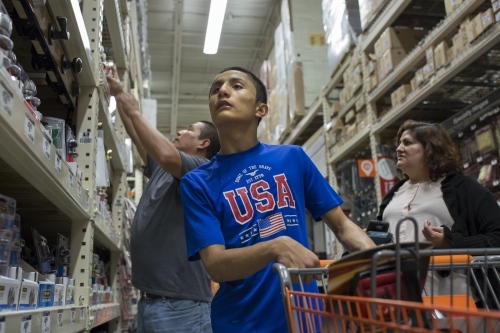 Ricardo Pineda and Veronica Castro with her son Juan Pablo shop at a Home Depot store. The family went to the store to buy flashlights due to a power outage in their neighborhood. 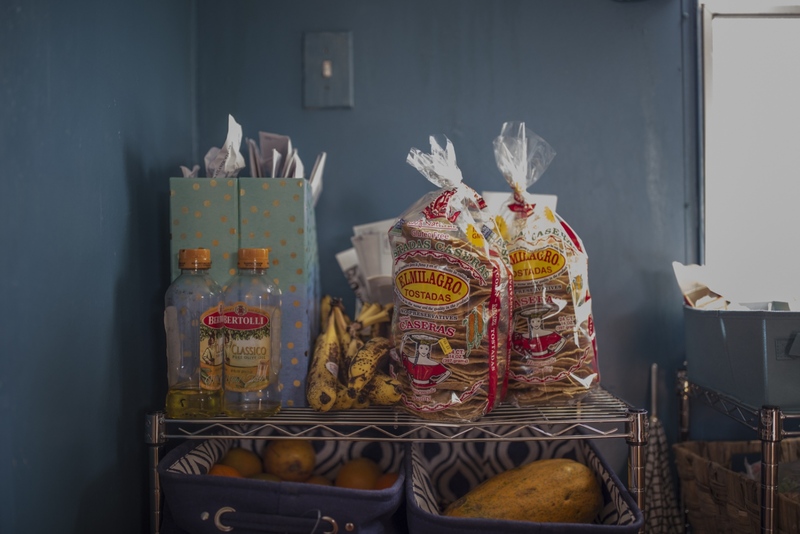 Detail of a corner of the Pineda’s family kitchen. Veronica cooks every day for the family, most of the times Mexican dishes such as enchiladas and pozole. 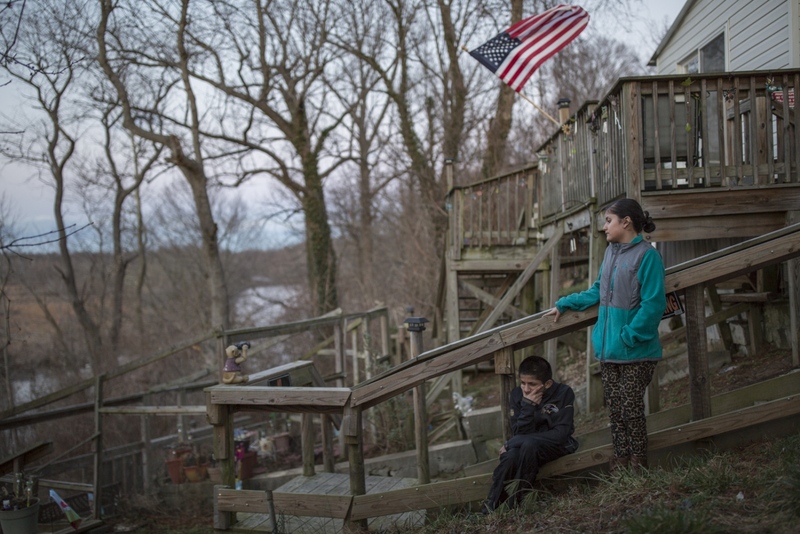 Veronica Castro in her mobile home in Lothian, MD. Castro takes care of her husband and their four children, one with cerebral palsy and one with brain damage, and is also facing a possible deportation. 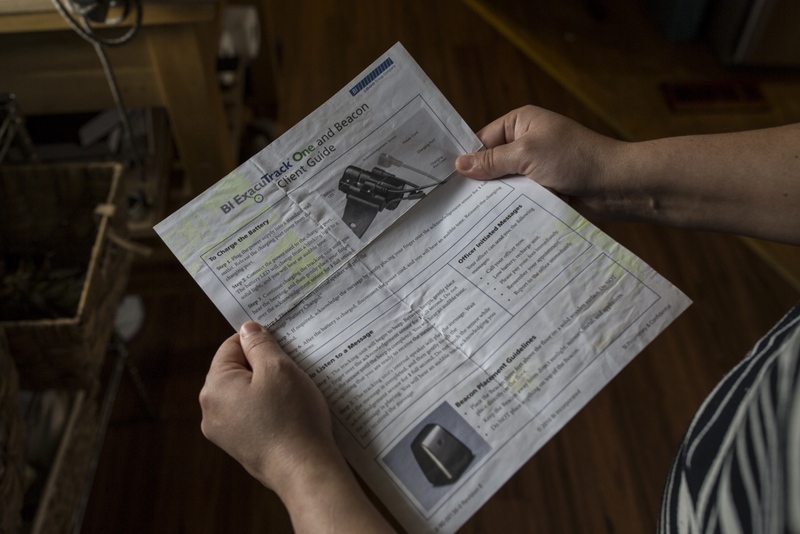 Veronica Castro shows the instructions of the electronic ankle bracelet she was placed when arrested by ICE that she keeps with other documents. Castro was placed the ankle bracelet when she was denied Parole in Place and her husband was still active duty. Army veteran Ricardo Pineda and his wife Veronica Castro stand outside a V.A. hospital just before Ricardo’s appointment in Washington D.C. Pineda’s appointments at the V.A. hospital are frequent and Veronica always goes with him. 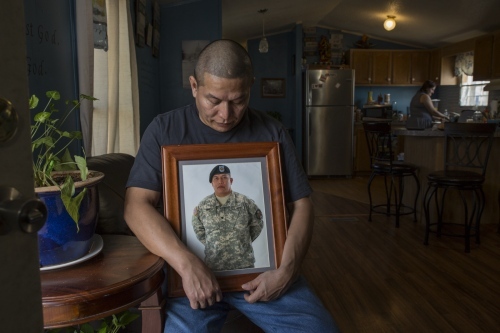 Army veteran Ricardo Pineda shows a photograph of himself when he was enlisted and wearing his military uniform while his wife Veronica washes dishes in the kitchen area of their mobile home. 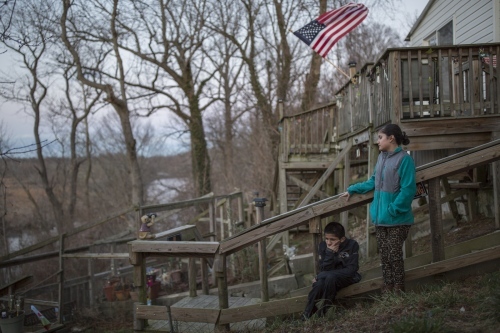 Kevin Pineda and his sister Emily stand in the backyard of their mobile home next to their neighbors’ deck. The siblings were born and raised in the United States and have never been to Mexico. Emily Pineda, 11, in her bedroom. Emily wants to join the Airforce when she is 18 and has military posters on the walls of her room. 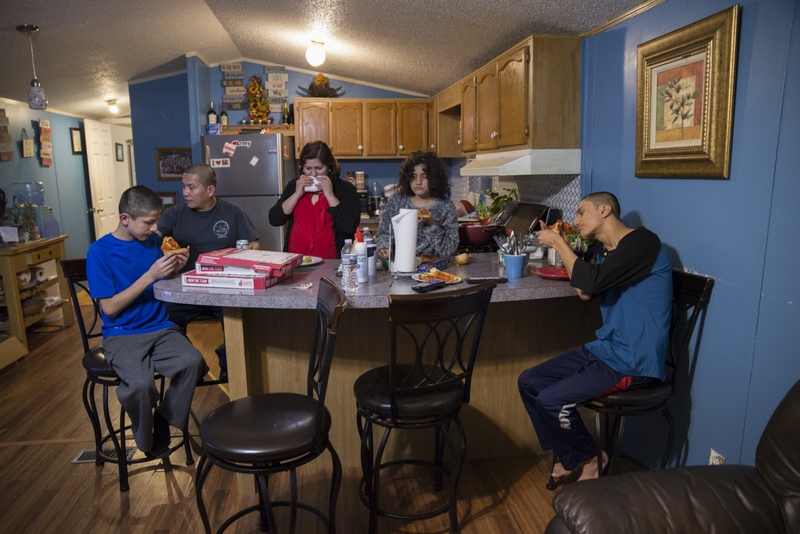 Ivan Pineda, 19, sits in the bedroom that he shares with his 2 brothers.. Ivan graduated from high school and is now working at a McDonalds to save money to go to college but in his free time he likes to be alone mainly in his room or walking in the neighborhood. Emily Pineda, 11, stands next to a lake close to her home. Juan Pablo Pineda’s old wheelchair outside the family house in Lothian, MD. Juan Pablo has brain damage resulting from complications during a heart surgery when he was three years old and was unable to walk for over 7 years. Veronica Castro helps her son Juan Pablo brush his teeth. Juan Pablo has brain damage resulting from complications during a heart surgery when he was three years old and is unable to perform personal hygiene activities such as bathing or teeth brushing by himself. Juan Pablo Pineda, 19, lays down on the couch while his mother Veronica shows the scars from Juan’s surgery. Juan Pablo had a heart surgery when he was 3 years old and he suffered brain damage due to complications with the anesthesia. Veronica Castro looks outside through a window from her mobile home in Lothian, MD. Veronica has a temporary work permit that allows her to stay in the country but has to go through immigration check-ups periodically and is always fearing a possible deportation.